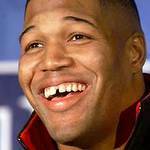 Michael Strahan, defensive end for the 2007 Super Bowl Champion New York Giants, and co-host of Live! With Kelly and Michael and Natasha Bedingfield, the British-born singer/song writer will help kick-off a $1 million fundraising campaign designed to assist CareOne/HealthBridge employees and their families, as well as researchers, in the fight against cancer. Tickets are $100 for adults and $20 for children under 12 and can be purchased online here. For more information about the event, please visit www.care-one.com.